Don't generate more clutter with the HUGE 58 INCH USB cable which is included with Fire TV Stick. At about 8 inches, this USB Cable is the ideal length to power your Fire TV Stick from the TV USB Port. 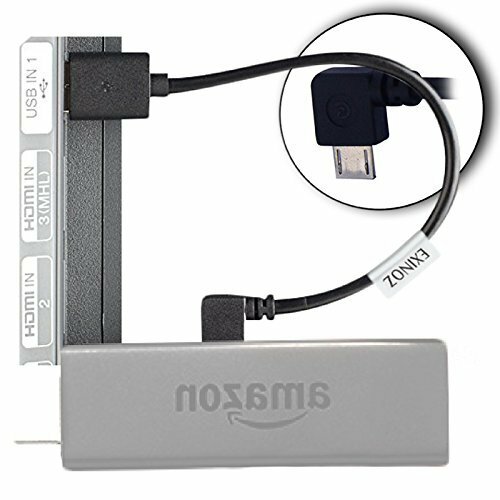 Our convenient USB Power Cable connects your Fire TV Stick to your TV's USB port. Our 90 degree connector is designed to minimize the length of cable required to connect your Fire TV Stick to your TV which reduces the amount of clutter behind your TV. If you have any questions about this product by Exinoz, contact us by completing and submitting the form below. If you are looking for a specif part number, please include it with your message.